A guide to making – and keeping – the connections that make your, our and everyone else’s world go round. The book walks you through everything you need to know about connecting with other people. 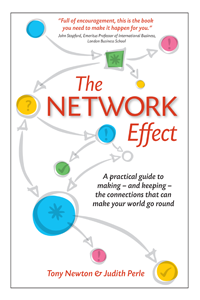 Judith and Tony’s goal in the book is to get away from the manipulative ‘working a room’ concept of networking. Instead, they use the results of research into human interactions coupled with real case studies to justify the hints, tips and suggestions they propose. Our brilliant newsletter is full of useful information on the latest research into personal business skills. It is about sharing useful information. There’s absolutely no hard sell! Call us on +44 (0)7947 010 342, email info@ManAdvan.com or fill out the form below.